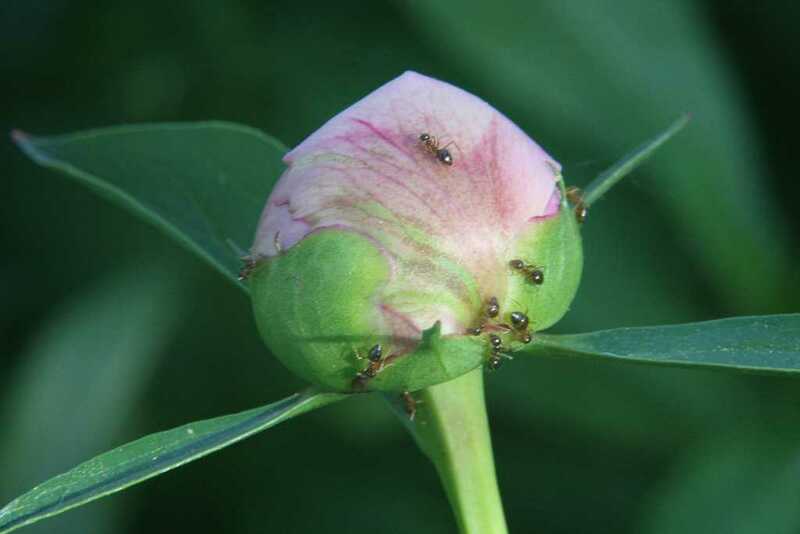 Ants are attracted to the sticky honeydew secreted by aphids, leafhoppers, mealybugs, whiteflies and scale insects. 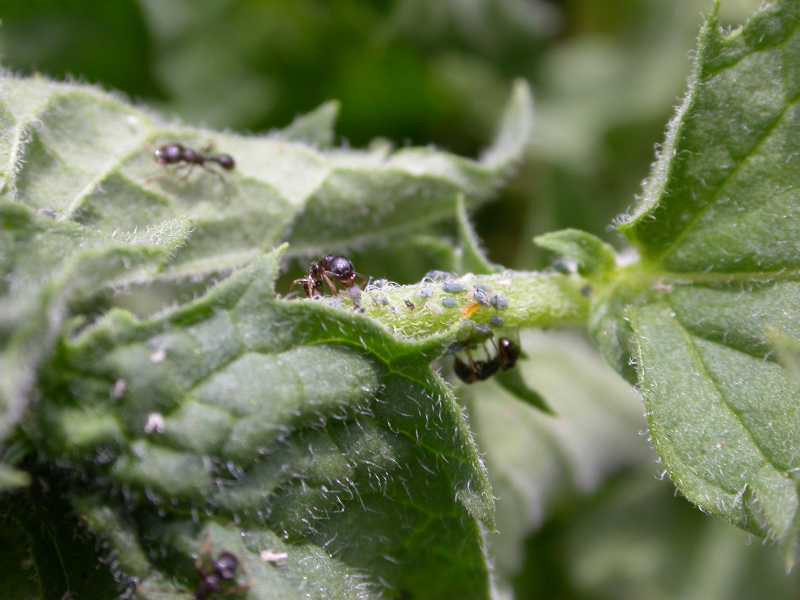 While not problematic in and of itself, the presence of ants in your garden may indicate and/or exacerbate aphid problems. 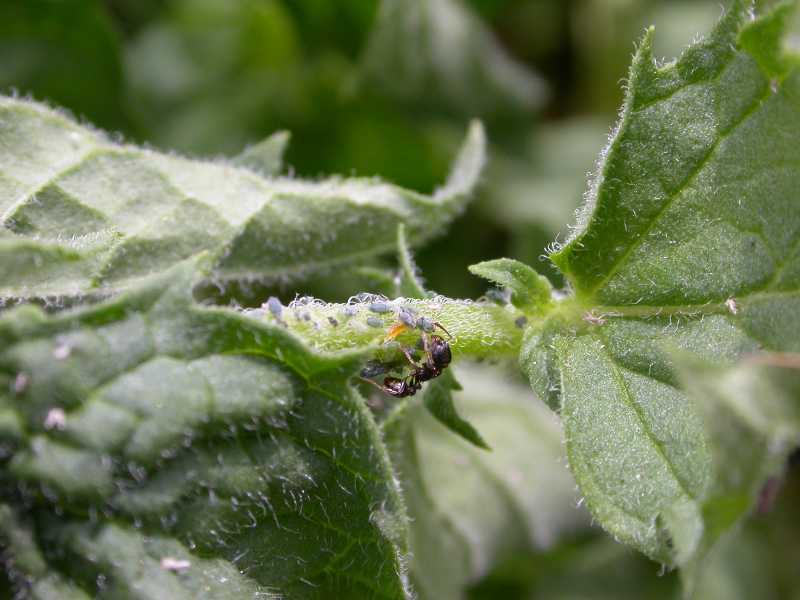 See Aphids, Hoppers, Mealybugs, Scales and Whiteflies. 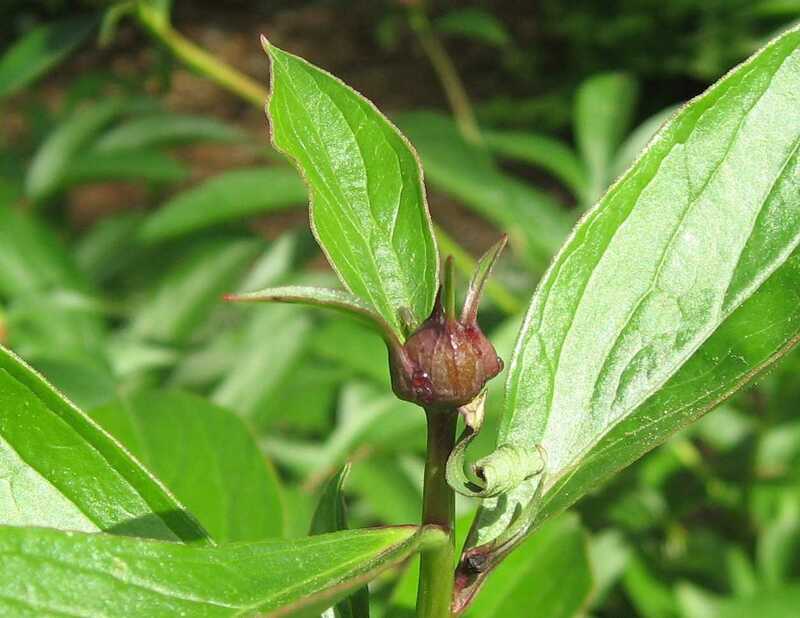 Specific recommendations for fruit trees. 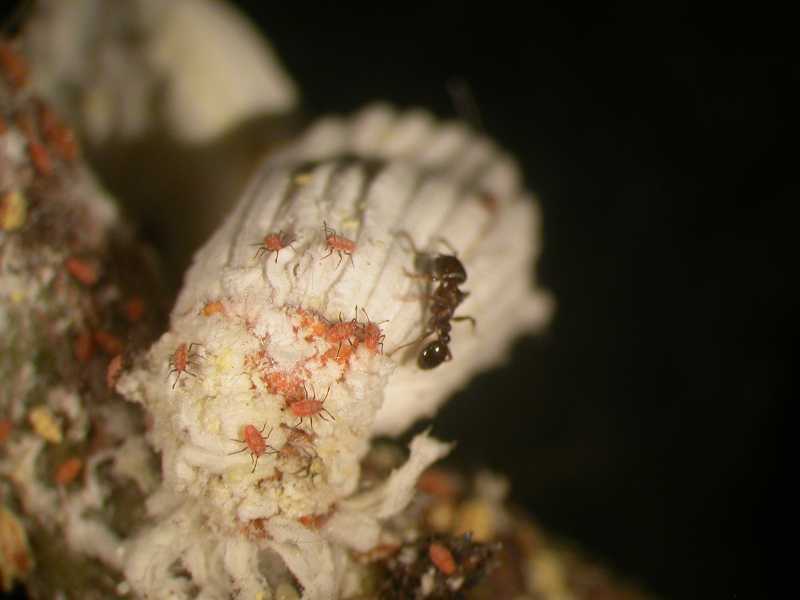 To prevent ants from entering the foliage crowns of fruit trees, where they may aggravate aphid problems, use a 4-inch wide strip of polyester fiber matting to snugly surround the trunk, covered by a 4-inch wide strip of household plastic wrap. 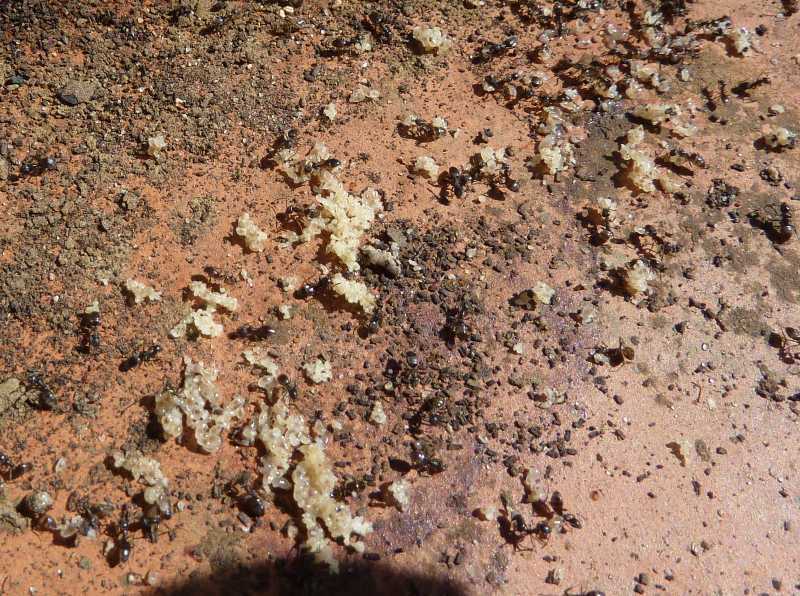 Smear this with a sticky substance such as Ant-Bar. The barrier will stretch as the tree grows, but once it splits, replace it. 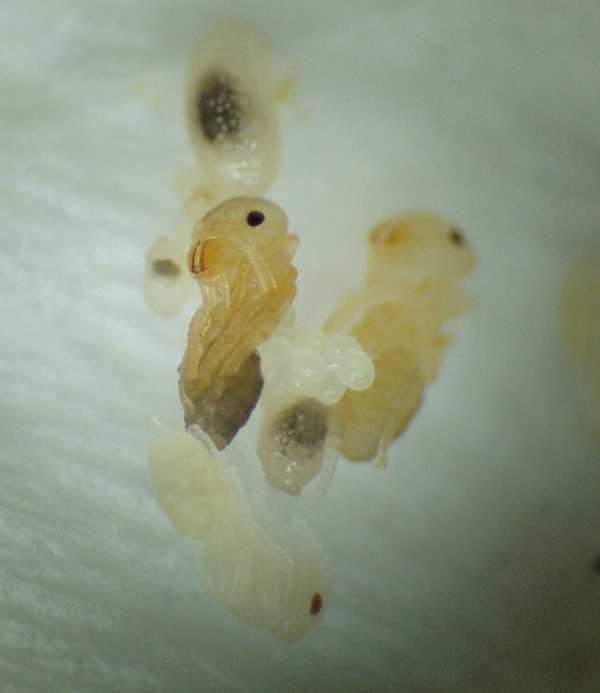 Indoor nests: Strategies 1, 2, 3, and 4 are strictly organic approaches. For an organic approach to Strategy 5, consult the Organic Materials Review Institute (OMRI™) for appropriate diatomaceous earth products. 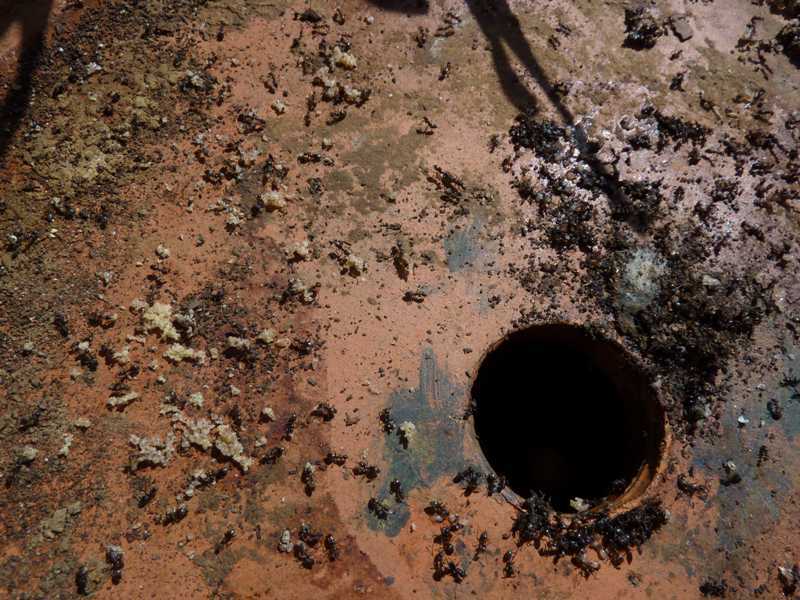 Outdoor nests: Strategies 1, 2, and 3 are strictly organic approaches. 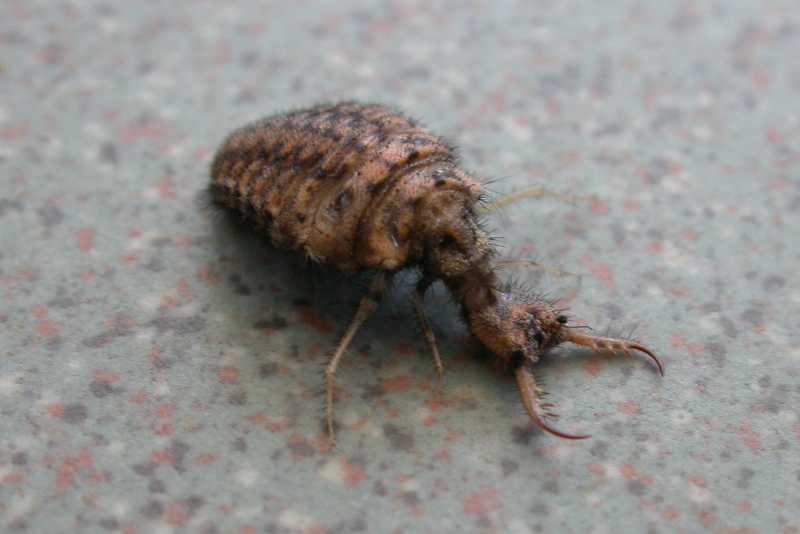 This antlion (Neuroptera) is a beneficial insect that preys on ants and other insects. 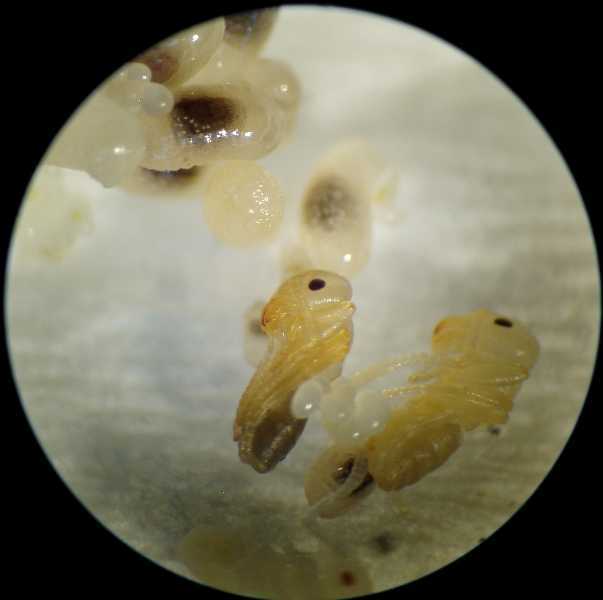 Three ant pupae (Hymenoptera) in various stages of maturity. 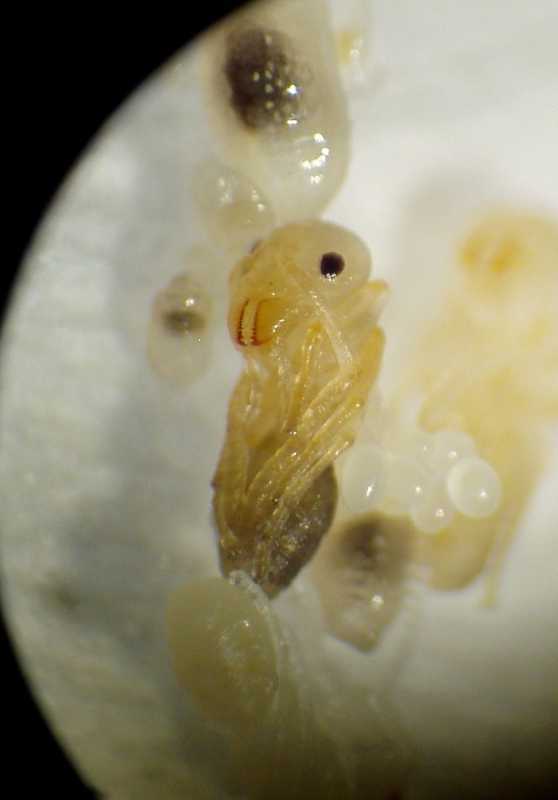 All have eyes. One is nearly colorless. 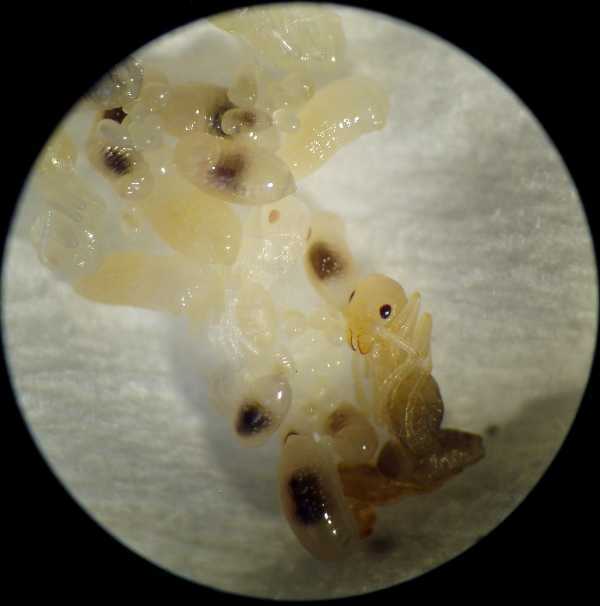 A cluster eggs is in the center. 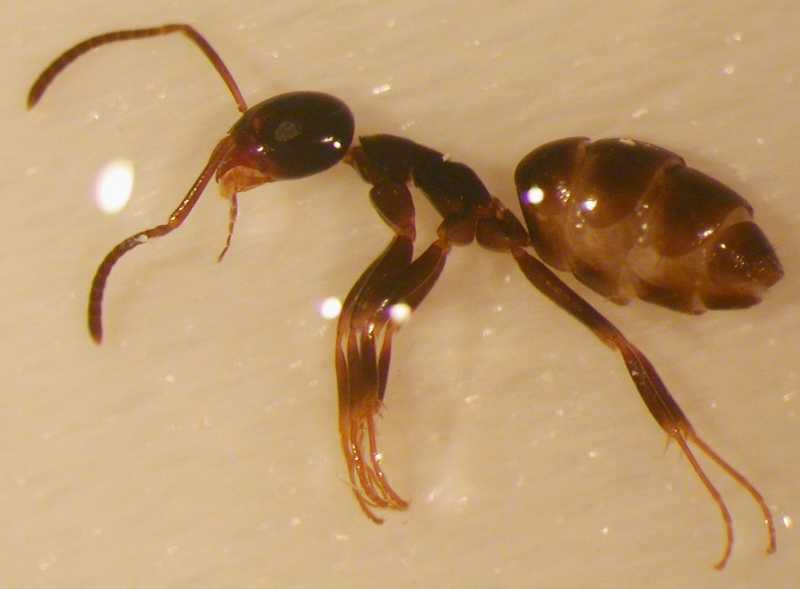 Close-up of ant pupae (Hymenoptera) with appendages and mandibles apparent. 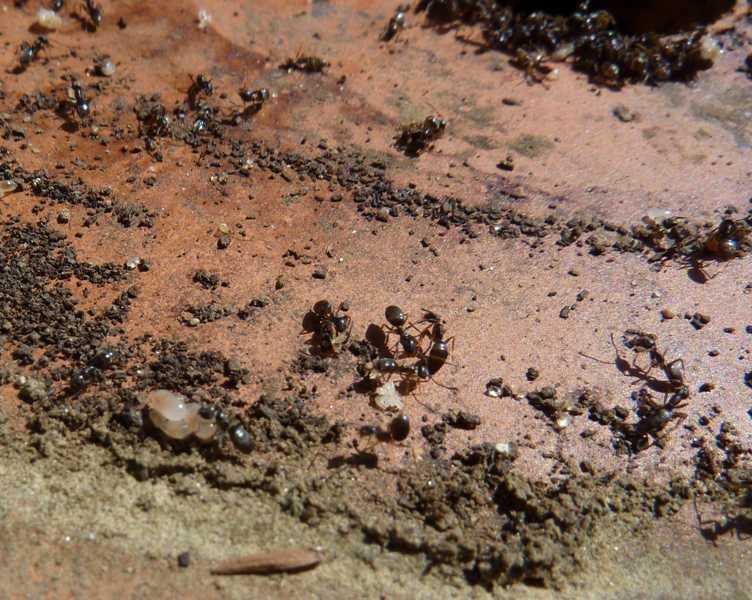 Exposing an ant nest (Hymenoptera) forces the adults to move the eggs, larvae, and pupae to a safer location. 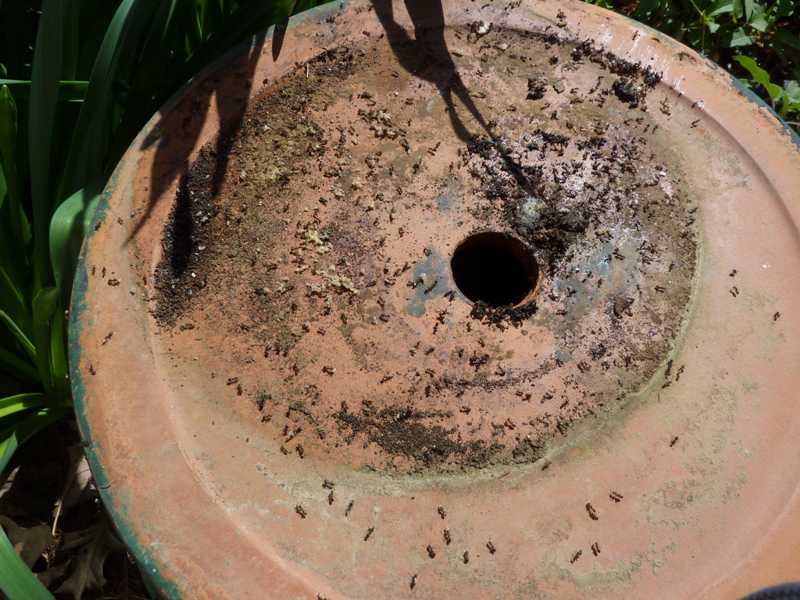 Ants (Hymenoptera) prefer nests that are high and dry, as here between two pots. 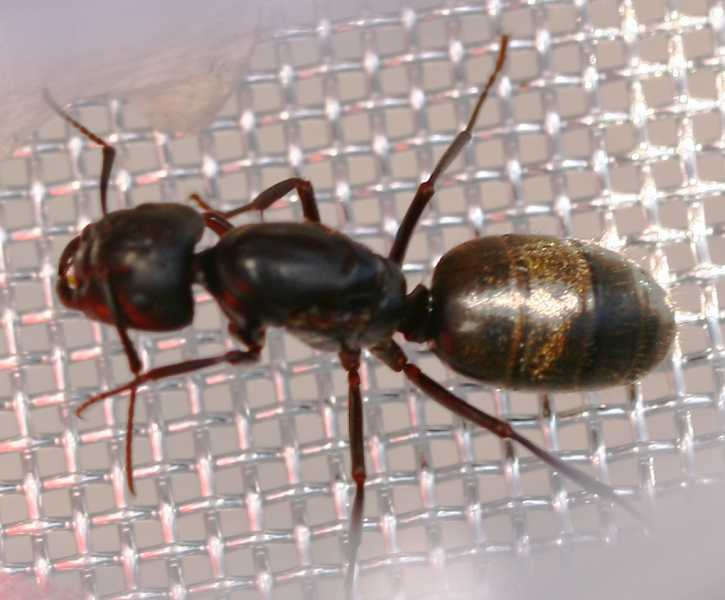 Ants (Hymenoptera) are as important as earthworms in soil aeration. 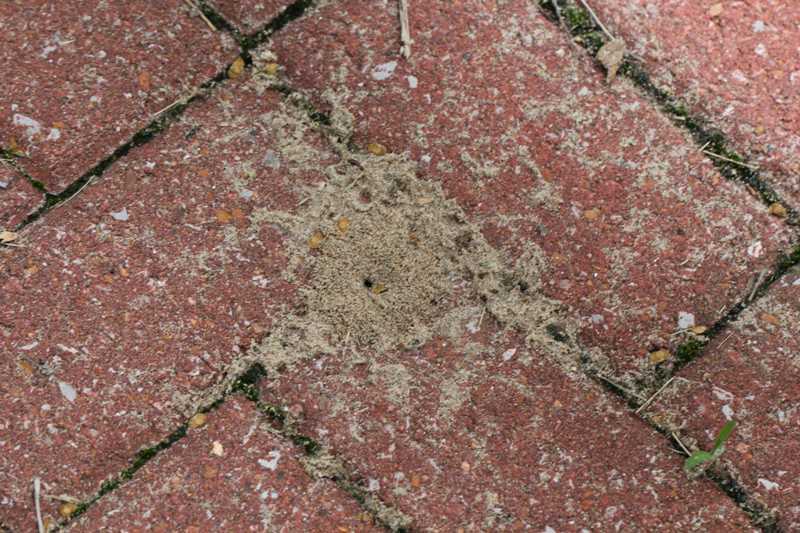 One result--an ant hill. 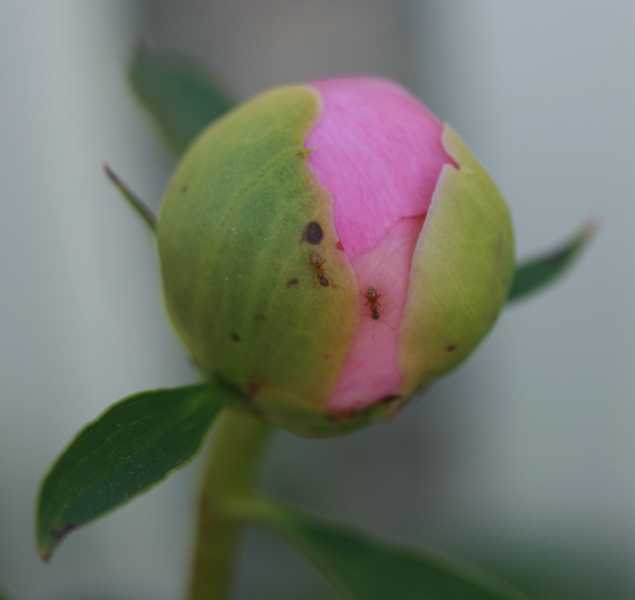 Do peonies (Paeonia) require ants (Hymenoptera) to bloom?--No. 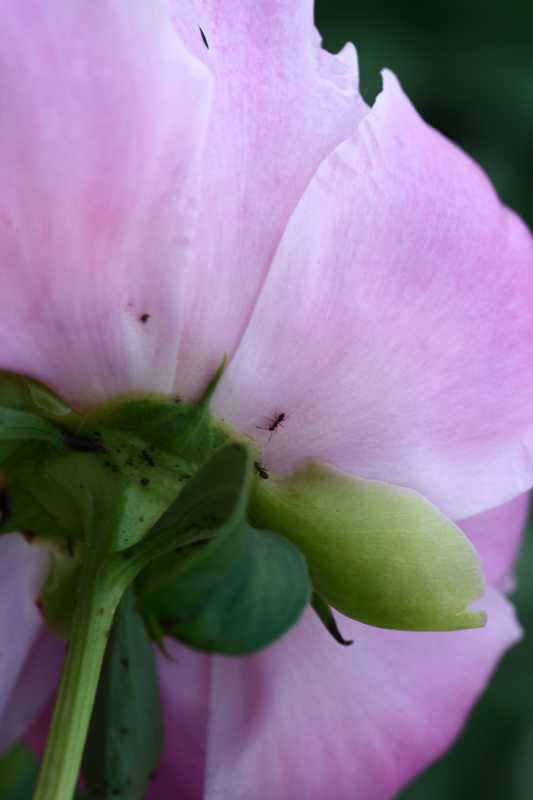 Do ants (Hymenoptera) injure peonies (Paeonia)?--No. 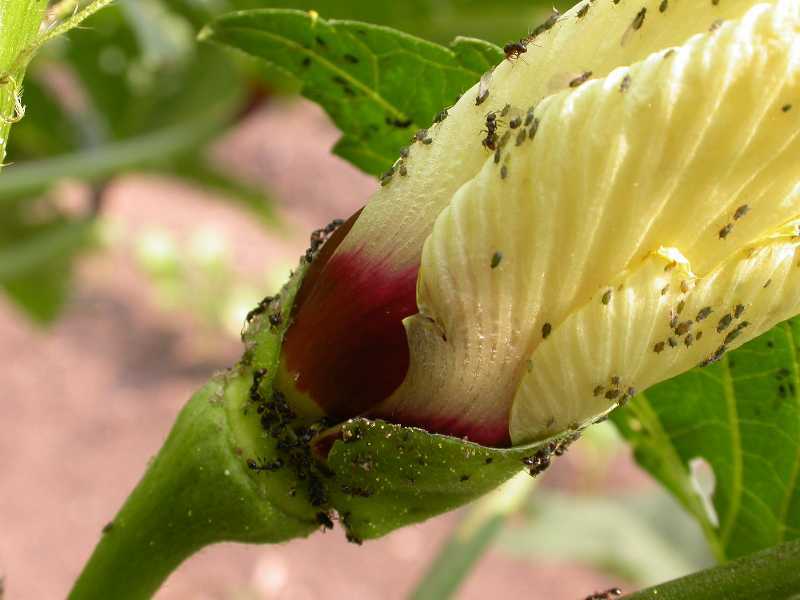 Ants, like other pollinators, are after the nectar.